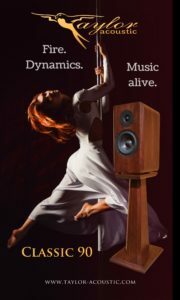 As Taylor Acoustic is celebrating their 20th anniversary, we will be introducing two new models of our high end loudspeaker range to the Public this year, and will bring you surpises! Let us introduce you one of our brand new monitor loudspeakers, Classic 90, which we will show you in Halle 1, A05 at High End 2018 Munich. This product is a small/medium sized monitor, which we call the “Cayenne pepper” of our portfolio. It is hot, lively and full of dynamics and energy. Despite its size (size without the tuned stand: 42cm (H) x 23 cm (W) x 27 cm (D)), it has a sensitivity of 88Db and a wide frequency range of 39 – 27.500 Hz. We deliver this product with our without a tuned stand. Classic 90 is a gem, that can fill smaller concert halls and rooms up to 90 m2 with the full experience of live music (sound and emotions). We are looking forward to meeting you in Halle 1, A05! Visit Taylor Acoustic and experience the taste of Classic 90 with your own ears!